It was supposed to be yesterday, but it didn't happen until today (we were running errands yesterday), my first attempt in plastering. 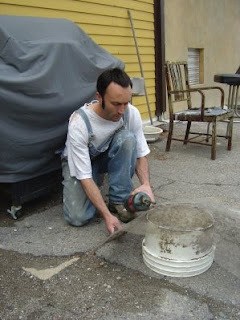 For sifting the lime and finish plaster I built a tami from an old bucket and window screen. I melted the screen straight onto the bucket with a blow torch (don't breath the fumes). And off we go mixing the plaster (in case you're looking for a Christmas present for me, how about t-shirts without holes in the shoulders). Now, I make it sound like it's easy, but rest assured, I was flirting with a martini night. 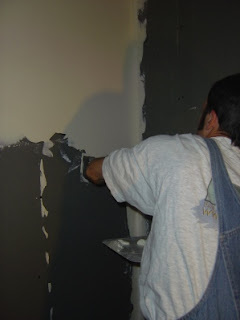 First I didn't make enough plaster, so halfway through the wall I ran out of mud. 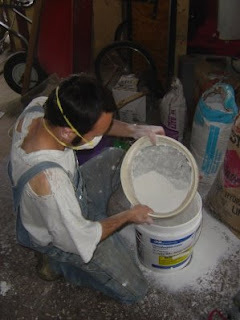 The big problem is that the plaster started setting too fast, so I had to rush to mix the second batch, slap it on, and still manage to smooth trowel the first batch. This worked out alright on the first wall (I picked a small wall as my first attempt for a good reason, aside from that it is also in the bathroom that never sees sunlight, and is therefore more forgiving). On the second wall, I totally failed, ok, not totally, but I made a crucial mistake in my math. Having learned from the first wall, I wanted to make a larger batch, but I didn't think straight and actually made it smaller, yet I added the right amount of tint for the larger batch. 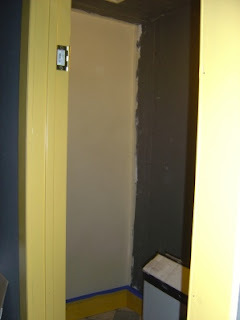 Now the wall looked a lot more yellow, I ran out of mud earlier, had to mix more, messed up more math, ran out of mud again, had to mix even more, ran out again just shy of the top of the wall. By that time, the first batch had set too much already to smooth trowel it. Not a biggy, I'll just plaster over it, and get it over with, but as you can see, not a fun day, though I ended up not being too stressed out, hence no martini, just a beer, or two.